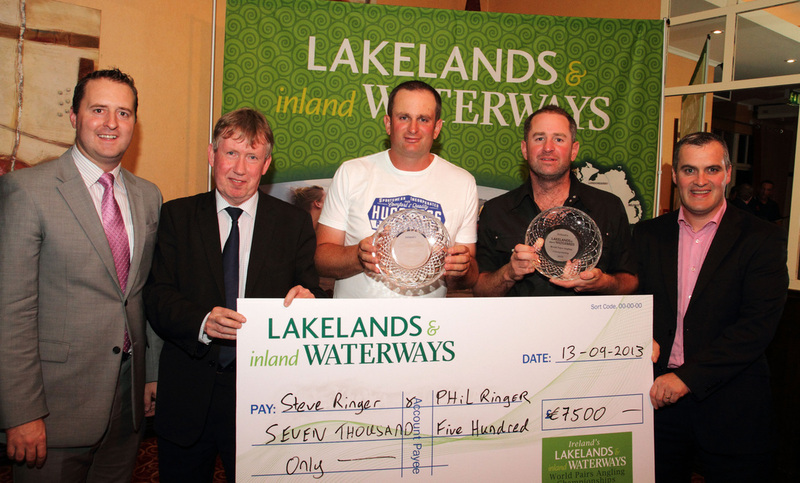 At the end of a week of incredible fishing, full of twists and turns, Northern Ireland/Republic of Ireland pair, Philip Jackson and Cathal Hughes, retained their crown as Lakelands and Inland Waterways World Pairs Angling Champions and picked up a mighty cheque for €16,000. Holding off a strong challenge from Preston Innovations EnglandFeeder Team Internationals, Steve and Phil Ringer, the Irish duo slammed an amazing 47.920kg on the scales. Their last day performance capped a week where weights eclipsed the previous year. 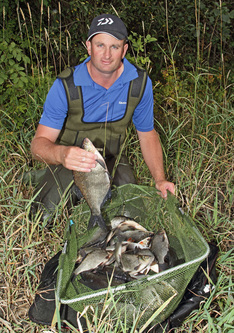 Over the course of the week, there were twelve weights in excess of 30kg (66lbs), capped by Cathal Hughes' 40.180kg from the river section of the Upper Lough Erne on the Crom Estate on Wednesday. Daiwa and Ringer Baits backed Steve Ringer was one of the big names drawn to fish the Lakelands and Inland Waterways World Pairs Angling Championship. 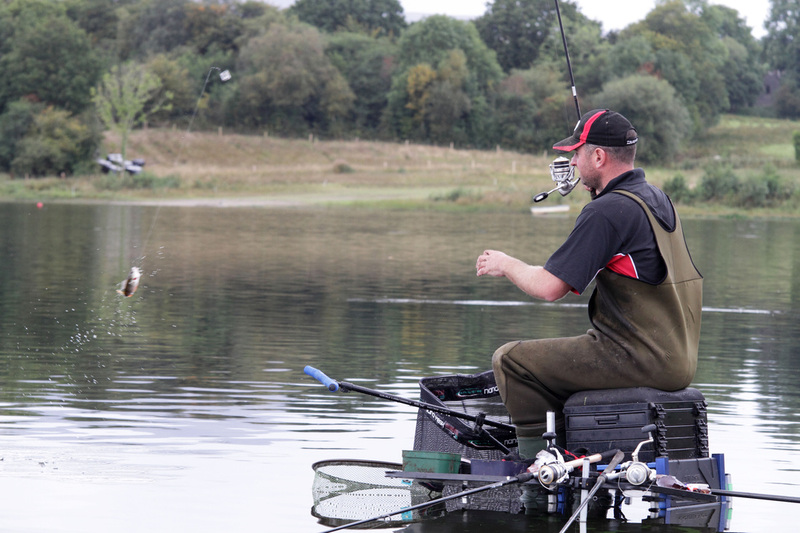 With brother Phil as his partner, he came to take on some of the best match anglers in Europe on venues and in a country he had never fished before. Unluckily, he fell just short of both pairs’ and individual wins, picking up second place in both. 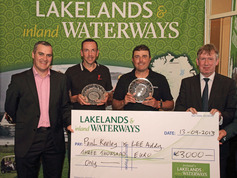 Paul Keeley and Lee Addy were a credible third and received a cheque for €3,000. 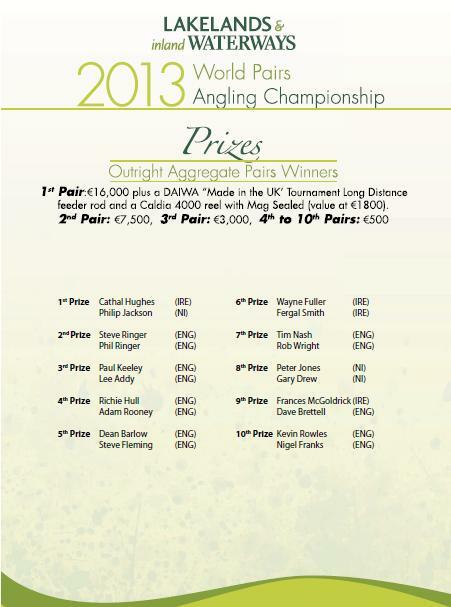 The top ten pairs shared the €30,000 guaranteed prize fund - see the results page for all winners.